Corner of High and Maple Street. In the Fruit Belt neighborhood, East Side. St. John Fruit Belt Community Development. 5,400 sq.ft. combination of two brick Italianate houses joined together in 1890. Secured; some open windows. Empty for the last thirty years. Home of John Meidenbauer, a doctor and instructor at the University of Buffalo�s College of Pharmacy. The Maple Street part of the house also served as Meidenbauer�s medical office. 2005 - After Lyle Morgan died, the house was left to one of his sons, who was unable to keep up with taxes on the building, and the city took it about 2005. 2010 - John Gulick, owner of J.A. Gulick Window Co., contacts the City about renovating the property. He worked with an architect and put together a formal proposal before being told it was not available, despite it being abandoned. 2011 - Rev. Michael Chapman, pastor of St. John Baptist Church, was given designated developer status. Jan 2013 - Per Elizabeth Licata in her article in Buffalo Spree, contractor and artisan John Gulick has been attempting to purchase it from the city and restore it, with no success so far. March 2014 - Public hearing on the building's demolition Tuesday March 11 at 8:30am City Hall. St. John Baptist Church is the City's designated developer and wants it demolished to make room for a surface parking lot for the proposed Sweet Pea market next door. Project architect Kevin Connors says there is flexibility with the site plan to accommodate the structure at 204 High if the rear portion was demolished for a driveway. March 14, 2014 - Preservation Buffalo Niagara is supporting a local landmark nomination for the address at 204 High Street & 291 Maple Street. "Originally built around 1870 these two homes were joined together by 1890 through a small addition. Home to John Meidenbauer, a doctor and instructor at the University of Buffalo's College of Pharmacy, the home on Maple also served as his doctor's office according to historic documents. A National Register Eligibility evaluation written by the New York State Historic Preservation Office in 2011 confirmed that the structure is eligible for entry in the National Register of Historic Places due to its embodiment of distinctive characteristics of a type, period or method of construction." "This brick Italianate structure is one of the oldest in the Fruit Belt neighborhood on the east side and is directly adjacent to the burgeoning medical campus. It has recently been announced that a market will go on the site of the Meidenbauer home which has prompted neighborhood residents to respond with concern about the fate of the historic home. An interested party had come forward looking to purchase the City owned property. When an agreement with the City could not be reached it prompted a Buffalo Spree article on City property practices." "The nomination will be reviewed by the Preservation Board in the coming weeks. We will of course update you on the outcome and any further developments in this case." July 15, 2014 - WIVB: "The Buffalo Planning Board heard a request from St. John Baptist Fruit Belt Community Development to build the market one block east of the current proposal. The new site would be between Mulberry and Locust Streets and save the Civil War-era home at 204 High Street." 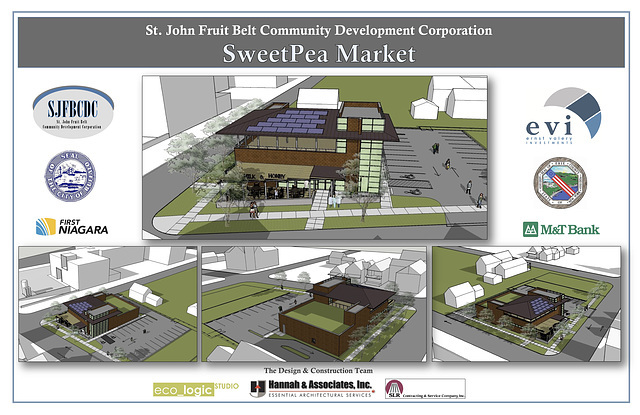 July, 2014 - Business First: "The Buffalo Planning Board has approved a revised proposal by St. John Baptist Fruit Belt CDC to develop a two-story, 7,000-square-foot full-service market on High Street, on a site across from its original location." January, 2016 - Business First: "Buffalo Seeks Bidders for Historic High Street Property"
February 2016 - Sam Savarino and Bernice Radle submitted a proposal for conversion of the building to "office and community space". No response as of October 2016, possibly because of a Fruit Belt development moratorium. May 16, 2017 - The Buffalo Common Council approved its nomination as a Local Landmark, after having tabled it three years ago.